Mission: The main objective of the residency is to provide an opportunity for artists in all media including writers and performing artists to meet, exchange ideas, possibly cooperate and enjoy the peaceful life and scenery of the island. Our vision is to be substainable and non profitable residency. Hrísey, the island, is by the north coast of Iceland, short from the arctic circle. The island is surrounded with a breathtaking view of the mountains on the coast of Eyjafjordur and the atmosphere will put you back in time of peace and wonderful nature. Perfect inspiration for artists. The Old Schoolhouse has been decorated (facilitated) with three bedrooms and working area so individuals or groups can work their art. The Old Schoolhouse is centered in the small village, with a good view over the area, on the south coast of the island, ca. 10 min. walk from the harbour. Population about 200 persons. In Old Schoolhouse is everything you need for pleasant stay: three different bedrooms, working area for three persons or groups, internet connection, sitting room combined with kitchen, shower, washing machine, television, etc. Cost: Housing: 350-450 EUR, travel, and food. The fee has to been payed at the latest month after approval. This arrangement will help us to have time to fill your post in case you find that you are unable to come to Hrisey. Please note: Money wiring fees are to be paid by the sender. Accommodations: 4 rooms (1 – 4 persons each room), Sitting room and kitchen combined, Toilet and shower. (Hot spring water from the island, you can take long showers), bed linen included. Benefits: Around the island are some natural energy spots, sources where you can recharge yourself. Big part of the island is private property but walking paths are located where you can walk. There is a good variety of birds that nest on the island so you have to stay on the marked walking trails. For bird-watchers there is a special hut a little bit north of the village. There are three marked walking paths on the southern half of the island: 2.3, 4.5 and 5 km. 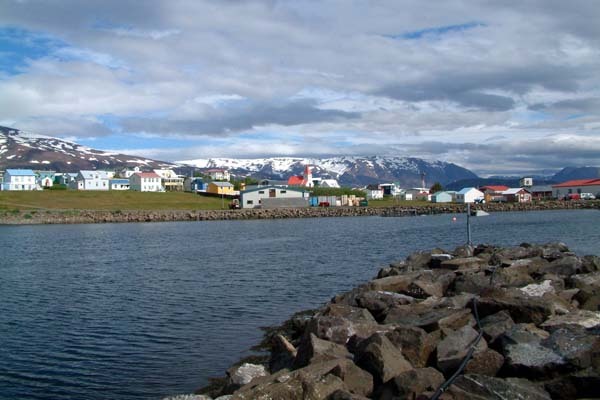 The island includes Swimming pool, Shop – There is one shop in the middle of the village, Restaurant/café – Brekka, Post office, and Museums – The House of Shark Jörundur – Holt / Memorial Museum of Alda Halldórsdóttir. Posted in Hrísey, Iceland, Old SchoolTagged all media, arctic circle, aritsts, Art, art residency, Artist, Artist Residency, artist run, atmosphere, bedrooms, bird watching, breathtaking views, cafe, coast, collaborate, cooperate, deposit, exchange ideas, Eyjafjordur, food, free application fee, Gamli skóli, groups, harbour, housing, Hrísey, hut, iceland, individuals, inspiration, internet, island, kitchen, life, live/work, living room, Memorial Museum of Alda Halldórsdóttir, mountains, museums, natural energy spots, non profit, north coast, northern iceland, Old Schoolhouse, peace, peaceful, performing artists, post office, Rate My Artist Residency, recharge yourself, residency cost, restaurant, scenery, shop, shower, small village, Studio, sustainable, swimming pool, television, the house of shark Jörundur, travel, variety of birds, walking paths, washing machine, wonderful nature, WritersBookmark the permalink. The scenery is beautiful, quiet and isolated. The mountain fjords, lighthouse, bird life, and nature trails are particularly spectacular. The groups are small, usually at four residents per month. The schoolhouse is charming, comfortable and beautifully decorated with retro antiques– much cozier than the stark exterior implies. The island has one small grocery store that is limited to the basics. It doesn’t have much fresh food, but you’ll find pasta, rice, cereal, eggs, milk and yogurt. On most days you’ll feel like you have the whole island to yourself. Be aware that public transportation is very limited. The ferry runs every two hours, which is great, but the mainland harbor is quite desolate, and you have to walk/run 2km to the nearest bus stop. If no one offers you a ride during your walk, you can catch a bus to Akureyri, which comes three times a day. It might take a few tries to time it all right. I stayed on the island for the whole month, so this was only a concern at my arrival and departure. Last thing I would mention is that the caretaker is more of a neighbor who does not live on the premise. If something goes wrong with the plumbing, lights, fire alarm, or if you need a ride, there might not be anyone available for (immediate) assistance. Overall, I would recommend this residency to an artist who is less interested in socializing, and more interested in getting work done.